Do you remember Charles Williams? To us, he seemed like the ideal neighbor: he had his own garage, complete with lifts, and was always happy and willing to help out a friend work on their cars. Unfortunately, Charles’ own neighbors were the worst neighbors this side of a manure incinerator, and spent countless hours and dollars trying to make him stop. Well, I’m happy to say that Charles has finally, completely, won. We’ve been covering the story of Williams since late last year. As you may recall, he’s a wheelchair user after an industrial accident took his legs, but he loves cars, so his elaborate home garage became his main social outlet. He wasn’t violating any zoning laws, and his request for a special permit for the garage was turned down because he didn’t actually even need a special permit. That should give you an idea who Williams has been dealing with. After a judge ruled in favor of Williams last November, the neighbors appealed the decision, which sent the case to the Delaware Supreme Court. On June 30, Chief Justice Leo Strine and Justices James T. Vaughn Jr. and Karen Valihura affirmed the previous judge’s decision in favor of Williams and his garage. 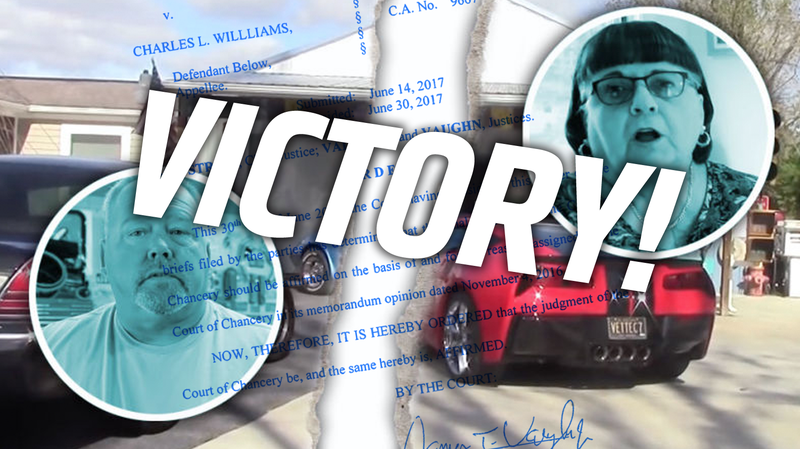 That means, finally, after six long and expensive years, Charles Williams’ absurd battle is finally over, and he won. And for his part, Williams told the Cape Gazette that the kindness of total strangers and fellow gearheads helped him get through. A Gofundme account created after the 2016 article raised about $58,000 to help defray legal costs. Williams said after taxes and fees, it helped cover nearly $40,000 he spent on legal fees. He said he thanks everyone for their support during his ordeal. The garage stays, Charles can continue to work on his and his friends’ cars, and, for this one moment, all is right in the world.